Towns and villages across Shropshire will commemorate the centenary of the end of the First World War as part of Remembrance Sunday events this weekend. Events will be taking place through the day to remember the men and women who gave their lives in combat – with both Armistice Day and Remembrance Sunday falling on the same day this year. This year will be particularly poignant as Sunday 11 November marks a century since the end of World War One, which claimed a total of 5,286 lives from the county of Shropshire. This event commemorates The Armistice signed by the Allies of World War I for the cessation of hostilities of the Western Front. The day has since become one of remembrance for all those who have died during times of war. Commemorations will take place at the War Memorial in the Castle Grounds from 10.40am. With a service at the War Memorial, Castle Grounds from 10.50am in which crosses will be planted by Guides. At 11am a two minutes silence will be observed followed by wreath laying and a parade to St Leonard’s Church past a saluting base in High St. At 11.30am a service will take place at St Leonard’s Church including a sermon. An event in the Castle Hall will then take place to commemorate the Centenary of World War 1 where there will be refreshments and live entertainment following the Church Service in St. Leonard’s Church. All are welcome. A Remembrance service and parade will take place in Broseley between 10.30am and 11.30am. Church Street and High Street will be closed during these times. Meet at 10am at Village Hall car park. There will be a parade of uniformed services at 10.15am with a service to start at St Andrew’s Church at 10.30am. A wreath will laid on the memorial within the church at 11am. The reverend and parish council representatives will travel to Brockton Memorial for a service of rededication and laying a second wreath at 11.30am. Cound Parish Council is playing its part in Battle’s Over, an international commemoration marking 100 years since the guns fell silent at the end of World War I. The council has arranged for the Last Post to be sounded at 6.55pm and a Beacon to be lit at a high point in the Parish in the area of Harnage. From the Church pass through Harnage and parking will be sign posted. If you wish to be present gather by the Beacon at 18:45 When the Beacon is lit you will be able to see other Beacons and at 19:05 we should hear Church Bells in other Parishes. Please assemble at the car park adjacent to the RBL Club in Station Road, Dawley, for 10.15am. March at 10.30am to the service at the Methodist Centre, arriving no later than 10.40am. Wreaths will be laid during the service. Parade returns to the RBL Club after the service for refreshment. This will be attended by council leader Councillor Shaun Davies. A joint Remembrance Day Service with the garrison community will take place at 10.45am at St Matthews Church, Donnington Wood during which wreaths will be laid. Assemble at the War Memorial on Winifred’s Drive for an Ecumenical Service during which wreaths will be laid. Armistice Service at 9.30am with wreath laying ceremony. Organised by The Royal British Legion Ellesmere and District Branch a parade will depart from the town centre at 10.40am to the War Memorial for a two minute silence and wreath laying service. Armistice Service at 9.30am at St John’s Church, Great Bolas, with wreath laying ceremony. Parade assembles from 10–10.15am at Castle Farm Community Centre. 10.25am the parade forms and at 10.40am the parade moves off along High Street and via Waterloo Road, Sunningdale and Crescent Road to the Cenotaph in Manse Road. 10.55am the parade arrives at the Cenotaph for the Service and Wreath Laying. 11.15am Service at Hadley Methodist Church. After the service, a short parade back and march-past to Castle Farm Community Centre via the High Street for refreshments. 10.50am Service at St Michael and All Angels Church, High Ercall. Act of Remembrance at 11am to include wreath laying. 10.50am Service at St Luke’s Church, Ironbridge. The Wreath is laid at the war memorial in the church. Following the service there will be a procession to the war memorial in Ironbridge Square for the further laying of wreaths. Please assemble at the foot of Memorial Bridge, Boat Inn, Jackfield for 10.45am. The service commences shortly after 10.50am during which the wreath laying will take place. The Royal British Legion Jackfield wreath bearer will ascend steps to lay a wreath on the bridge. The service concludes around 11.30am and refreshments are available afterwards in the Boat Inn – all welcome. Take your seat in the church, St Mary the Virgin, Ketley at 10.45am ready for the Silence at 11am. This will be followed by a service and wreath laying ceremony at the War Memorial in the churchyard. There will be a parade and memorial service organised by Meadows Primary School in conjunction with Ketley Parish Council. They will march to the flower bed at the traffic lights where poppies will be placed at the feet of the silent soldier. 6.30pm Service at St Chad’s Church, Kynnersley. Act of Remembrance to include wreath laying. Holy Communion Service takes place at 9.15am along with the Act of Remembrance at St John the Evangelist Church, Lawley. Wreaths will be laid during the service. This will be attended by borough mayor Councillor Raj Mehta. Service at 10.50am at St Lawrence Church, Church Road, Little Wenlock followed by Wreath Laying Ceremony at The Memorial in the church grounds. Ludlow’s Remembrance Sunday Service begins at the Peace Memorial by Ludlow Market. Those wishing to attend should arrive on the Market Square by 10.30am to see the Civic and Church processions arrive at Peace Memorial, followed by the arrival of the Parade, which will set off from Ludlow Castle. The Act of Remembrance and wreath laying will take place at the outdoor Peace Memorial service. Afterwards, there will be a Parade to St Laurence’s Church for a Parade Service. Everyone is welcome to attend the Parade Service, please enter the church through the main porch door. Please assemble at 10.15am at the Woodside Centre, Park Lane, Woodside. The parade proceeds via Park Lane, Mound Way, Ironbridge Road, Park Street, Maddocks, Victoria Road and along Russell Road to arrive at the Cenotaph in Madeley for the Wreath Laying Service at 10.45am. Refreshments will be available in the Cricket Club after the event. This will be attended by cabinet member Councillor Rae Evans. Holy Communion Service begins at 10.45am at St Leonards, Malinslee to include an Act of Remembrance and Wreath Laying. At 9am a parade marches off from Queen Street car park on route to St Mary’s Church under the Command of Market Drayton Parade Marshall with a Piper leading the parade. At 9.45am a service commences at St Mary’s Church with a Royal British Legion representative to perform Act of Homage. A Bugler will play the Last Post & Reveille at the rear of the church 10.45am. The parade then marches off on route to the War Memorial in Cheshire Street. A salute to be taken by Market Drayton Mayor & Senior Officers outside NatWest Bank before the parade forms at the War Memorial at 10.55am ahead of a two minutes silence Reveille & Lament by Piper at 11am. This is followed by a memorial service at 11.10am with wreath laying at 11.30am. The parade will then depart to The Royal British Legion Club where a Civic Reception will take place at noon. At 6pm a Beacon of Light will be lit at 6pm at Town Park, Manor Gardens. Assemble at 10.10am on Audley Avenue and march off at 10.15am to St Nicholas Church for the service which commences at 11.00am. Wreaths will be laid after the service in the church grounds. Followed by a parade back to the Royal British Legion Club at approximately 12.10pm. Service at 9:30am at Holy Trinity Church, Holyhead Road, Oakengates. A service will also be held at 10am at Salvation Army Hall, Oakengates to be followed by a march commencing at 10.30am from outside the Hall. There will be a parade to the Memorial Gates at Hartshill Park where there will be a shared Act of Remembrance including the laying of wreaths (meet at the gates at 10.45am if not attending the service or parading). This will be attended by cabinet member Councillor Hilda Rhodes. A Festival of Remembrance takes place at Oakengates Theatre @ The Place at 8pm on Sunday 11 November. One of the largest Remembrance parades in Oswestry is anticipated this Sunday with over 400 representatives of local organisations expected to form the parade from the Bailey Head to be led by Porthywaen Band. A service at 11am will take place at the Memorial Gates to be led by the Rev Simon Thorburn followed by the traditional service of Remembrance in St Oswald’s Parish Church. The Remembrance arrangements are coordinated by the Oswestry Branch of the Royal British Legion and the Town Council. The Parade Marshall will be Jason Till of Oswestry School. Large crowds are expected at the Memorial Gates so please arrive early. The sound of bugle call will pierce the night sky over Old Oswestry hillfort on November 11 at 6.55pm as a WW1 centenary beacon is lit on the 3,000 year-old monument at 7pm. Service commences at 10.55am at St Peters Church, Church Road, Snedshill, Priorslee, which incorporates the Wreath Laying Ceremony. The Royal Air Force Museum Cosford will hold a Service of Remembrance on Sunday 11 November, paying respect to those service men and women who made the ultimate sacrifice during their tours of duty. 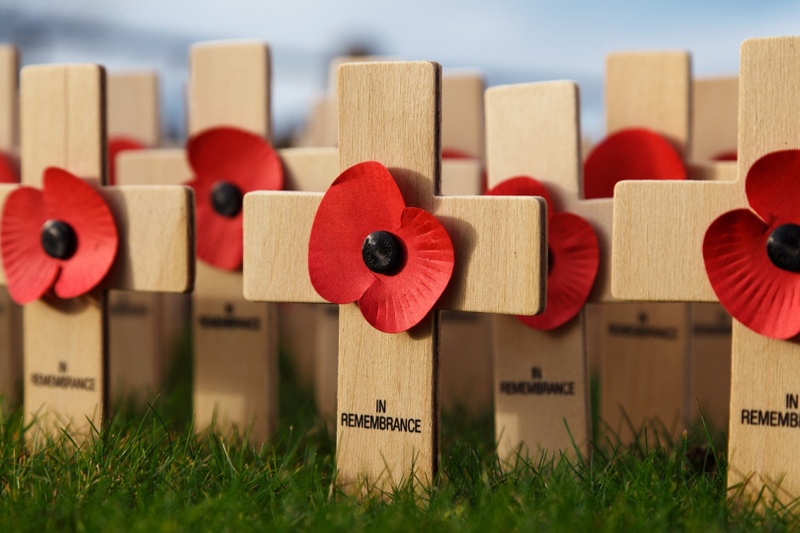 Visitors who wish to pay their respects and reflect on the sacrifices made by our brave service men and women are invited to join the service, led by the Station Chaplain at RAF Cosford. Those attending will also be treated to renditions from the Cosford Military Wives Choir, who will perform for visitors on arrival and during the service. The service will take place in the Museum’s Hangar 1 and visitors are politely requested to assemble no later than 10:30am ready for the Service to commence at 10.45am. As well as readings, there will be hymns and the sounding of ‘The Last Post’, followed by a two minute silence. During the service, wreaths will be laid by representatives from RAF Cosford, RAF Museum staff and volunteers, Cosford Military Wives Choir and Castle Bromwich Junior School in honour of those who have fallen in the line of duty. Following the service visitors are free to explore the Museum at their own leisure. A Remembrance Sunday service will take place at St Chad’s Church at 9.45am, those wishing to attend are asked to be seated by 9.20am. A civic procession will leave the castle at 9am to St. Chad’s Church. The Mayor, and other civic dignitaries, will walk along with units of HM Forces and Service organisations to music. There will also be a wreath-laying ceremony at the War Memorial in the Quarry at 11am. A bugler will sound Last Post, which will be followed by two minutes silence. A march-past and salute will follow immediately after the wreath laying ceremony on St. Chad’s Terrace. From 4.30pm until 7.30pm on Sunday ‘in the shadow of voices’ – a Son et lumière performance of One Name One Voice will take place in Shrewsbury’s Quarry Park at the War Memorial. A short Act of Remembrance at the Memorial Gates, Recreation Ground, St Georges at 10.45am followed by a Service at St Georges Parish Church at 11am. These will be attended by cabinet members Councillor John Minor and Richard Overton. Light refreshments will be available at Meeting Point House from 9.30am. This will be followed by a parade organised by Hollinswood and Randlay Parish Council at 10.20am from Southwater Square to the Remembrance Memorial in Telford Town Park where there will be a short service to include wreath laying from 10.30am. Two minutes silence at 11am. 3pm Service at St Michael’s Church, Waters Upton. Act of Remembrance to include wreath laying. Parade assembles at 10.15am at Nailor’s Row Car Park and leaves at 10.25am. The Parade proceeds to the top of New Street, march through Market Square and into Church Street arriving at the Lych Gate (in front of All Saints Church) in time for the short service at 10.45am. Following the service at approximately 11.15am, the parade will march back to the car park by the same route in reverse for dismissal. Descendants of the fallen are invited. The bells at All Saints Church will be ringing. A United Service of Remembrance will be held at The Parish Church, Wem commencing at 10.50am on the grass around the Memorial followed by a service in the Parish Church. British Legion Members, Scouts, Guides, Brownies and all other interested organisations are invited to assemble at the main car park at 10.30am ready for march off at 10.45am. The Parade will be led by The Wem Jubilee Band. At 7pm on Sunday evening Wem Branch of the Royal British Legion along with Wem Town Council will be lighting a memorial beacon on Wem Recreation Ground. At 10am the last post and wreath laying will take place at the Cenotaph on Station Road. Followed at 10.55am with a service of remembrance at St Alkmund’s Church. Between 12.30pm and 2.30pm light refreshments will take place at the Civic Centre with all welcome. A shared service with the Salvation Army band will be held at St Mary & St Leonard commencing at 4.00pm. The Act of Remembrance will include a wreath laying event. Service of Remembrance at Wrockwardine Wood Holy Trinity Church, Wrockwardine Wood. Assemble at 10.45am, for the 11.00am Remembrance Day Service at Wrockwardine Wood Holy Trinity Church, Church Road, Wrockwardine Wood. Meet at the War Memorial located on the triangular junction down from St Peter’s Church at 10.45am. Service begins at 10.50am when wreaths will be laid at the Memorial. Two minutes’ silence and the remainder of the service will be held in the Church followed by light refreshments. We have made every effort to ensure the listings in the article are correct and hold no responsibility for any time changes or errors. If there is no listing for a Shropshire town or Village we may not have been able to gather enough information regarding any event taking place.